I’m a nanny – not a doctor, nurse, or lactation specialist. My advice on breastfeeding has always come from a mixture of personal research and observation. Any serious concerns or questions, I’ll tell parents, should be directed at the appropriate health professionals. But I am often involved in changes in breastfeeding and can give basic advice and share my opinions and experiences. I’m a childcarer, and so by default, most of the babies I’ve worked with are not with mum 24 hours a day. I have certainly worked with far more bottle fed or mixed bottle/breastfed babies than exclusively breastfed. But the overall numbers for breastfeeding at 6 months surprised me. I wonder if, in a way, the pressure many mums feel to breastfeed is almost creating a sense of helplessness. There’s often, very unfairly I feel, negative judgement towards a mother who doesn’t breastfeed. Could the guidelines feel unobtainable for many mothers, who then move away from breastfeeding more easily than they might have, feeling overwhelmed by the expectations? My base line for breastfeeding advice has always been that I’d recommend trying it, first of all. The first 3 days after birth are when the baby gets colostrum, a thicker kind of breastmilk that is highly nutritious, boosts baby’s immune system, and encourages her first stool. After about 3 days the mature, more ‘normal’, milk comes in. That’s the first hurdle to try to get over, where your baby is getting enormous benefits from your breastmilk. From this point on, I still recommend breastfeeding BUT, and this is important: Not at all costs. This is where I feel that breastfeeding becomes an issue that divides, upsets, and confuses people. The various health departments of Such and What may tell you breast is best. But so is a mother without postpartum depression, so is a baby who is getting enough nutrition from their feeds and enough sleep with full enough bellies to rest properly, so is a healthy and happy bond between baby and mother, and between baby and father or other significant carer, so is enough money coming in from a paying job to supply baby with her needs, …… so are many other variables that could be adversely affected by forcing breastfeeding when it doesn’t seem to be working or is becoming unmanageable. I try to encourage new mothers to begin to breastfeed and then not to feel bad if and when they stop, or mix with formula feeds. There are lots of reasons why parents decide to introduce formula and I doubt very often it’s because they just can’t be bothered breastfeeding and don’t care what the recommendations are. Formula options are pretty damn good these days and you’re definitely not hurting your baby to use them. There are benefits to bottle feeding, such as the ability to see how much baby eats, or for another person to share the feeding responsibility/pleasure. You could express and try to reap the benefits of both bottle and breast, although this intensifies time issues that often are the reason for bottle feeding; when mum returns to work, for instance. Like I said, I’m not an expert on this topic. But, I do spend a lot of time with mothers who have decided not to breastfeed exclusively before 6 months. I think that the stress they can feel about finding the right option and balancing competing needs in their baby, themselves, and their wider lives can have an enormously detrimental effect on their baby and themselves. When I hear that only 15% of babies are breastfed at an age where it is recommended that 100% are, from the perspective of a carer who works in homes one-on-one with parents and babies, I immediately feel the most pressing issue is a disconnect between the medical advice and real lives of families. Just throwing figures and statistics at people and telling them what they ‘should’ do clearly doesn’t achieve what these organisations and associations hope for, and certainly doesn’t make the families choosing not to breastfeed feel supported or understood. 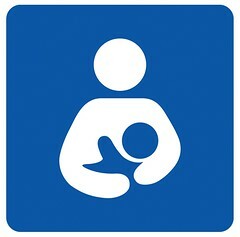 What are your experiences of, or thoughts about, breastfeeding? I don’t think the ability to see how much your baby eats is a good reason to give up breast feeding (unless possibly when there is a medical concern). When anxious first time mothers are helped to deal with that concern, there is rarely a problem. I’m not a professional expert on breast feeding, but I’m a mental health professional and breast fed two children, and work with many moms in my practice. And for most, once you get past the learning curve, breast feeding is a unique and extremely beneficial and satisfying experience for both baby and mom. Way too many mom-baby dyads are deprived of this because of difficult starts, etc. and here in the US lactation consulting comes at a high price and is available in mostly rarified communities. But as Nanny points out, the worst thing for moms is to feel watched, criticized and judged by either the medical professions and by other moms and unfortunately that seems to happen here way too often. Yes there’s still a lot of stigma about public breastfeeding here in Australia too. Some people say it’s ‘unseemly’!